This blog post started out as some musings on the different way of measuring the changes in the mass of Antarctic land ice, as a follow up to a couple of comments to Jo Nova’s posting “Antarctica gaining Ice Mass — and is not extraordinary compared to 800 years of data.” The problem with this is that it looks at just part of the total ice mass balance. These lead me to look at the major papers that looked to Total Mass Balance. There are two from 2009, using early data from the GRACE satellite gravity mission Velicogna and Chen et al. In comparing the various estimates, I discovered three anomalies that should have been detected as part of the peer review process. When I tried to replicate this for Greenland, the figures worked out. Starting with 122 Gt/yr a year ice loss in 1992 and adding 30 to each year gives the “137 Gt/yr in 2002–2003 to 286 Gt/yr in 2007–2009“. 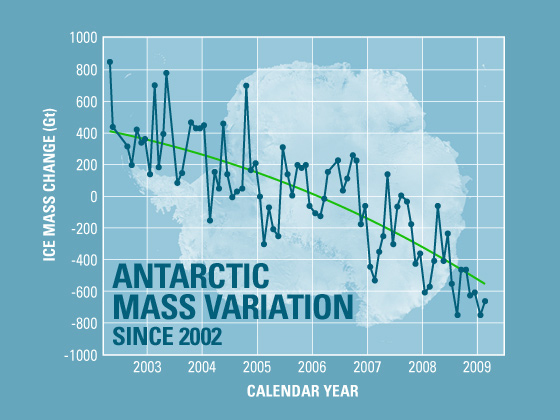 But for Antarctica, adding 26 to each year cannot give “the mass loss increased from 104 Gt/yr in 2002–2006 to 246 Gt/yr in 2006–2009“. However, if the statement is rephrased with the Greenland timescales as “the mass loss increased from 104 Gt/yr in 2002–2003 to 246 Gt/yr in 2007–2009” then the numbers work out. The spread sheet is easy to construct. For Velicogna Antarctica, start with -90 in 2002 and subtract 26 from the preceding year. The average uses the “=AVERAGE()” function in Excel. Table 2 includes two GRACE-based mass loss estimates of 104 Gt/year (Velicogna 2009) and 144 Gt/year (Chen et al. 2009) for the period 2002–2006 and two estimates of 246 Gt/year (Velicogna 2009) and of 220 Gt/year (Chen et al. 2009) for the period 2006–2009. Table 2 includes two GRACE-based mass loss estimates of 142 Gt/year (Velicogna 2009) and 144 Gt/year (Chen et al. 2009) for the period 2002–2006 and two estimates of 233 Gt/year (Velicogna 2009) and of 220 Gt/year (Chen et al. 2009) for the period 2006–2009. That is, the two papers become far more consistent if the averages are corrected. It would appear that Velicogna changed the dates without doing the maths. We find that during this time period the mass loss of the ice sheets is not a constant, but accelerating with time, i.e., that the GRACE observations are better represented by a quadratic trend than by a linear one, implying that the ice sheets contribution to sea level becomes larger with time. For ice melt Velicogna is stating that, not only would the trend be for each year to be greater than the previous year, but for the incremental increase to be greater than the last. But, if ∂M is the change in ice mass, from the following functions were used in my spread sheet to replicate both Velicogna’s and Chen’s results. These are all linear functions. I do not have access to Chen’s paper, but Velicogna’s abstract does not conform to her model. … our data suggest that East Antarctica is losing mass, mostly in coastal regions, at a rate of −57±52 Gt yr−1, apparently caused by increased ice loss since the year 2006. Chen detection of increased ice loss is similar to Velicogna’s. But unlike Velicogna, Chen suggests that there is a discontinuous function. In other words, Chen’s graph would look like this. Although it is possible to extrapolate from a discontinuous function, it would be highly misleading to do so. It suggests there is no underlying empirical relationship to be observed, in direct contradiction to Velicogna. Further, over a short period it is impossible to say whether this is the shift in the underlying rate of change in Antarctic melt, or if this new direction be quickly reversed. Fortunately, the two studies were published over three years ago, so there are alternative studies to compare the projection against. This will be the topic of the next post.